It all started in California. Shortly after the turn of the last century, it had become evident that “rules for the road” needed to be established. In 1901 Californians were anxious to police motorist, and thereby offering more protection to the general public. For reasons of safety, the recognition of the lifestyle change that the automobile was thrust on the lives of everyday citizens could not be ignored. The legislators put laws into effect that authorized cities and counties to issue licenses for automobiles and other wheeled vehicles. A license was required for bicycles and tricycles, carts and carriages. By 1905 if it had wheels and used public access to get from one place to another it had to be registered with the Secretary of State. Back then a reasonable $2, a little over $27 at today’s exchange, was required to obtain a license. The license was circular and had to be displayed in a prominent fashion on the vehicle. In addition, drivers were required to display their license numbers on the back of the vehicle in 3-inch tall black numbers on a white background. Some folks took to the idea of painting their numbers on their headlamps as well. No doubt a status symbol, as cars were still considered a luxury for quite a few people. To acquire a license the owner had to have his vehicle equipped with a horn or a bell, good brakes and lamps. That and a couple of bucks put you legally on the road. There wasn’t a driving test conducted at that time, assuming that if you had an automobile you certainly must know how to drive it. In 1913 the Secretary of State turned the task of vehicle registration over to the state treasurer. During that same year the Department of Public Works took over as custodian of vehicle records. 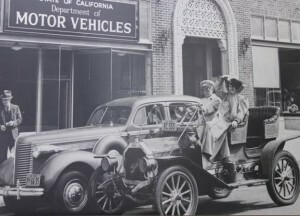 By the time the first Motor Vehicle Department was officially installed in 1915 there were an estimated 191,000 cars on California roads. The Vehicle Act of 1915 was the official start of the department, we are familiar with nationwide. Each State has it’s own Vehicle Act with it’s own rules of the road, but we can safely drive from coast to coast without fearing that we’ll get popped for some obscure violation. It wasn’t many years after 1915 that the revenue from issuing licenses was recognized as a profit center for the government. The responsibilities of the Department of Motor Vehicles were given to the Division of Motor Vehicles, a branch of the Department of Finance. It was much later, in 1931 that the DMV became an entity of it’s own – the department we are all familiar with today.